The ST reported today that about 100 of the 1,042 units in Marina One have been sold in bulk sales of three or more units since last Friday. This is after developer M+S enticed these early-bird buyers with a 10% discount, which brought prices down to between $1,900 and $3,100psf. M+S has said last week that it would initially sell units from the first residential block. The second block will be released only after the project is completed in 2017. Sales to buyers wishing to purchase two apartments are expected to begin tomorrow, while single-unit buyers will have to wait till Friday. It will certainly be interesting to see what kind of take-up rate Marina One will generate amongst the non-institutional, single-unit buyers. This is definitely one project that is too rich for our veins - although we have been asked to visit and provide our thoughts, the wife and I are uncertain if we are qualified enough to make it past the doors of the sale gallery, much less try to take photographs of the showflat! But even if the take-up is less than ideal after Friday, the wife and I are pretty confident that between Khazanah Nasional Berhad and Temasek Holdings, they will have no trouble getting some soveregin funds (somewhere) to boost sales. 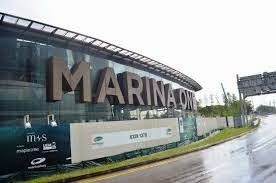 The news about Marina One came amid a HSR report released last Friday indicating that the price gap between private homes in the city centre and those in the city fringe is narrowing. If this phenomenon persists, which HSR expects as property prices keep falling, it may result in buyers/investors moving away from properties within the Core Central Region (CCR) and into the Rest of Central and Outside Central Regions (RCR/CCR). No Comment to " Of Marina One and the narrowing CCR - RCR/OCR price gap... "